Furi [official site] is a game entirely made up of boss battles. I haven’t completed it yet because the later fights are extremely difficult but I am absolutely determined to become so adept at the slashing and the hacking and the dodging and the shooting that I’ll be able to finish it on the harder difficulty level that unlocks upon completion. I want to be able to beat Furi so effectively that it stops fighting back but , like the freaky foes it contains, outwitting it will only cause it to transform into something even more devious. Quite how or why I love Furi is a bit of a mystery. I’m not a huge fan of bossfights, which too often rip up the known rules and introduce new ones just to confound the player, and I’m allergic to anime. This is a game with anime stylings – the protagonist is a grimly silent possibly-amnesiac prisoner with bone white hair and a sword that goes THWIP – that is wall to wall bosses. It’s like stumbling into the private bar at a hotel hosting a convention of regional managers. You can’t swing a dead cat, or a sword that goes THWIP, without hitting a boss. The rules are simple. You can dash to dodge projectiles, passing straight through them, and you can use your sword or gun to attack. The sword can parry as well, which handily provides a health boost should you get the timing just right, but there are no pickups or powerups or any other distractions. It’s you, a single enemy and an arena that is purpose-built to allow that enemy to make best use of their abilities. You can see one example of a fight in full here, though skip the video if you’d rather figure it all out for yourself. As mentioned above, all of the enemies have at least two different forms or attack patterns. That becomes dramatically evident during the second fight, which is the point when the game really grabbed me. Your opponent is a prisoner, as was your character at the beginning of the game, and she’s attached to a one-wheeled device that’s like a cross between a Segway and a gurney. Every time you smash her health bar to pieces, she breaks some part of the device, first freeing her arms, then her legs, eventually scuttling around on all fours like a terrifying spiderperson. 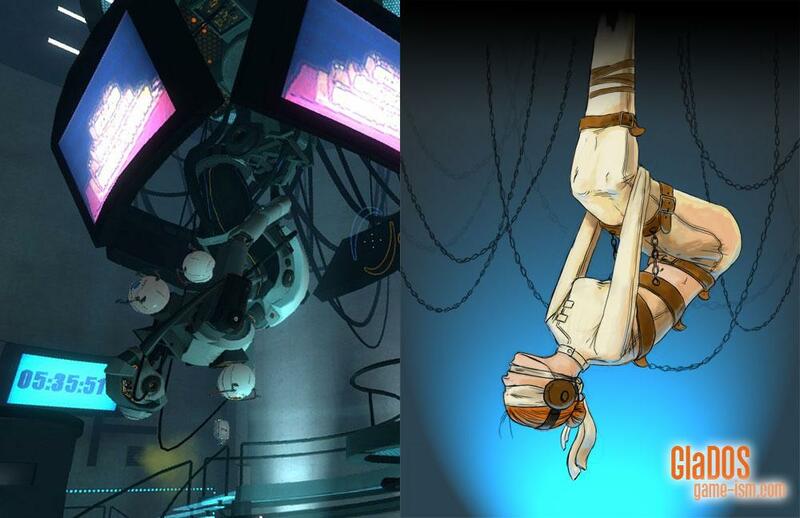 During the initial phase, strapped in place, she looks a lot like GLaDOS, something that’s much more evident if you’ve seen this interpretation of Portal’s potato/villain. There’s also more than a hint of The Evil Within’s most terrifying creature. This is important, not only because the character designs are superb but because the allusions to other games run through Furi like blood through veins. Right after the prisoner, you’ll face an old man who looks suspiciously like a semi-naked version of Metal Gear Solid’s The End. He even tells you that you should wait for him to die of old age – referencing one of Kojima and co’s sneakier tricks – taunting as you avoid his attacks and he turtles up behind rotating shields. He’s one of the only enemies in the game that has made me resort to sniping. It’s not really sniping as such, the shooting from afar. The arenas are too tight for that and motion is constant, but it’s possible to charge up the firearm by holding down one of the triggers. Standard fire is as in a twinstick shooter and the steady stream of bullets is usually enough to chip away at an enemy’s health bar, but Old Man Time’s shields reflect your normal shots so you’ll end up drowning in your own bouncing bullets. The charged shot is the solution, in this case. All of your abilities can be charged by holding down the appropriate button: a charged dash allows you to travel further, a charged shot stuns enemies and a charged slash can break through some defenses. It’s all so simple, with no combos or other complicated inputs to learn. The skills are all observation and reaction – you watch the enemies, you learn their behaviours, and you counter them. What’s astonishing is that there’s very little trial and error involved. Almost everything that happens in the game is telegraphed. Sometimes the telegraph has been launched directly at your face at great speed, and sometimes a messenger is slipping it into your back pocket while you’re distracted by a flashing light in the middle distance, but you can always see or sense it coming if you pay close attention. Again, just as with player inputs, that’s because Furi uses a few simple rules. Melee attacks that can be parried are marked by a blinking weapon just before the strike and there are tells in every colour-coded projectile and dangerzone. Sometimes the battlefield looks like one of the deeper circles of bullet hell, sometimes it looks like Devil May Cry and Afro Samurai have had a baby. And the Afro Samurai comparison makes perfect sense because the character designs are the work of Takashi Okazaki, creator of that manga series. They’re beautiful, even the protagonist who I mocked right at the beginning of this review. It’s all about the hair, which drifts as if he’s underwater, lovely ivory tendrils like weeds in the deep. The rest are more inventive and I won’t spoil any details other than for the two I’ve already covered. Those two are a good sample though. The first boss teaches you the ropes, as these things tend to do, though he still presents a challenge. The second is one of my favourites in the game (I haven’t seen the final one yet; the penultimate has been killing me all day) and the third, that old fellow, is my least favourite. There’s a lot of waiting around during his stints of invulnerability, dodging repetitive patterns of bullets and waiting for windows of opportunity. That’s Furi at its worst, to my mind. At its best, it uses all of those tightly scripted visual and kinetic rules to create superbly flexible fights. At its worst, it makes me repeat dodges and strikes while I wait for a sequence to end. The good news is that even at its worst, Furi is something rather special. Even the trudging between fights has some fairly nonsensical but engaging chatter and the scenery is gorgeous. Better still, pressing ‘x’ (or whatever equivalent your gamepad has – it’s playable without but not very effectively), automates all of the walking so that you can sit back and watch, or go and make a brew. It’s infuriating that you can’t just run through those in-between bits but even that is a compliment of sorts. The downtime is frustrating because showtime is so very good. Special mention should go to the music as well, with tracks from electro artists including Carpenter Brut and Danger. It’s the perfect accompaniment to the action. Furi is out now, for Windows. Tagged with feature, review, The Game Bakers, wot i think, Furi.